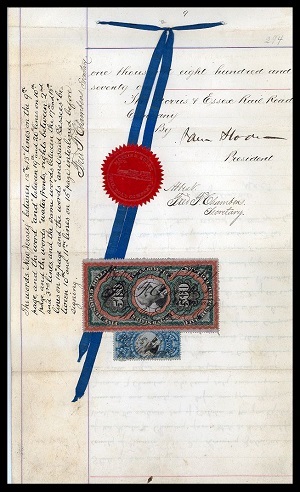 The First Issue of US revenue stamps was replaced in 1871, as the Department of Internal Revenue had received numerous reports of fraudulent cleaning and reuse of the first revenue stamps. The Department of Internal Revenue ordered a Second Issue with new designs and colors. In an effort to prevent their cleaning and reuse, the new revenue stamps were printed on a "chameleon" paper with silk fibers, which usually has a violet or pinkish tint. 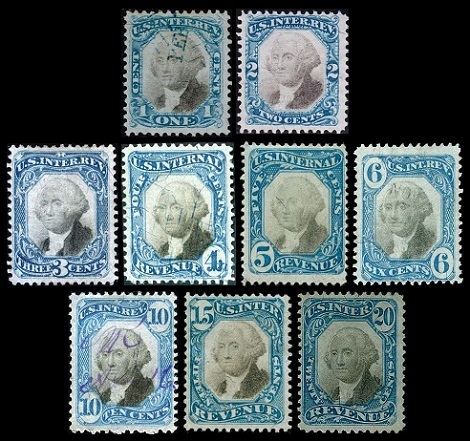 All of the new revenue stamps, except for the two highest denominations, were printed in blue and black, and they all feature the portrait of George Washington. 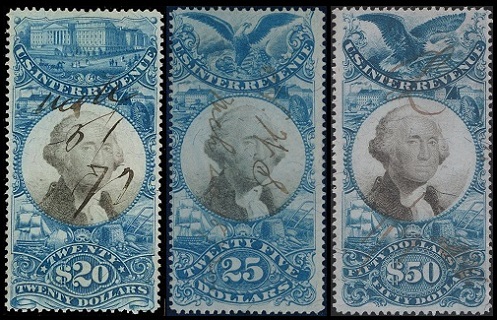 These new Second Issue US revenue stamps have the same denominations as the stamps of the First Issue, but they were all inscribed U.S. Internal Revenue. 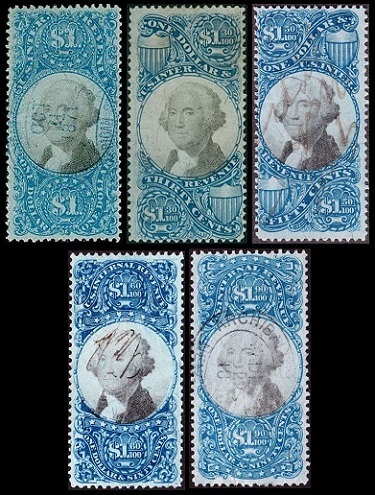 Thus there was only one stamp issued for each denomination, which resulted in the Second Issue having far less individual stamp types than the First Issue. These new US revenue stamps were only in use for a very short period. As a result, with the exception of the most frequently used denominations, they are very scarce. 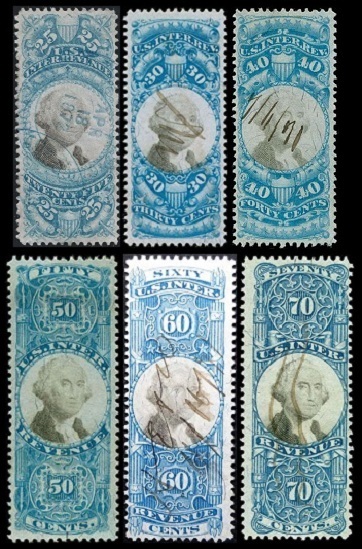 The most common types of cancellations on these Second Issue revenue stamps are circular or herringbone cut-cancels. Hand-stamped and manuscript cancels are worth more. The 1 C., 2 C., 5 C., 10 C., 20 C., 25 C., 50 C., 70 C., 1 D., and 5 D. denominations of these stamps exist with inverted centers. Most of them are rare, and they are seldom seen outside of major auction sales. 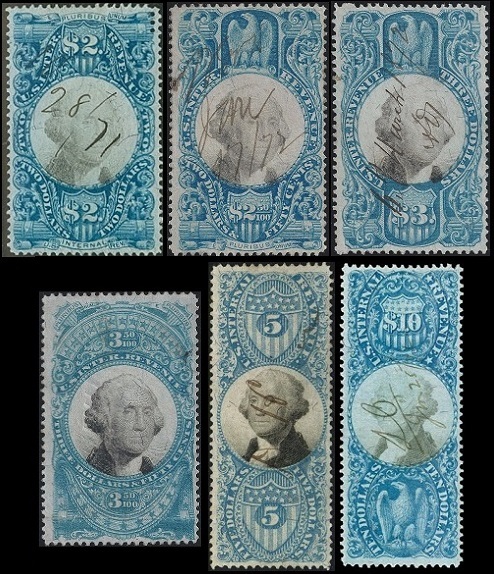 There are also forgeries of these inverted center revenue stamps. These inverted center stamps should ONLY be purchased with a certificate of authenticity. The two highest denomination stamps of the Second Issue are known by American philatelists as the "Persian Rugs", due to their size, multi-colored printing, and ornate designs. These were the World's first engraved, tricolor stamps. The printing process was so complex that these two stamps were printed one-at-a-time in panes containing a single stamp. These stamps are the benchmark for every great US revenue stamp collection, and they are ranked among the greatest rarities of US philately. The 200 Dollar denomination stamp (Sc. #R132) shown above was issued to pay the tax on transactions exceeding $200,000. Only 446 examples of this stamp were printed and used, of which about 125 are known to have survived. Only four examples, still tied to original documents, are known. The 500 Dollar denomination stamp (Sc. #R133) shown above was issued to pay the tax on transactions exceeding $500,000. 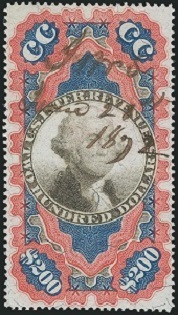 Only 204 examples of this stamp were printed and used, of which 67 are recorded as having survived. 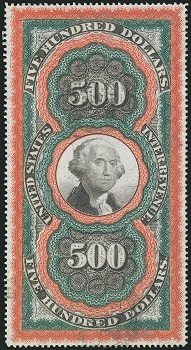 The 500 Dollar denomination stamp shown in the image above sold for $16,100 at an August 2015 Harmer-Schau auction. Only one example, still tied to the original document, is known. It was used on a $5,000,000 mortgage document of the Morris & Essex Railroad Co. There were originally ten of these stamps affixed to various locations in the mortgage document, but when it was sold in a 1949 auction, nine of the stamps were removed for individual sale, leaving only a single stamp remaining on the last page of the document, as shown above.